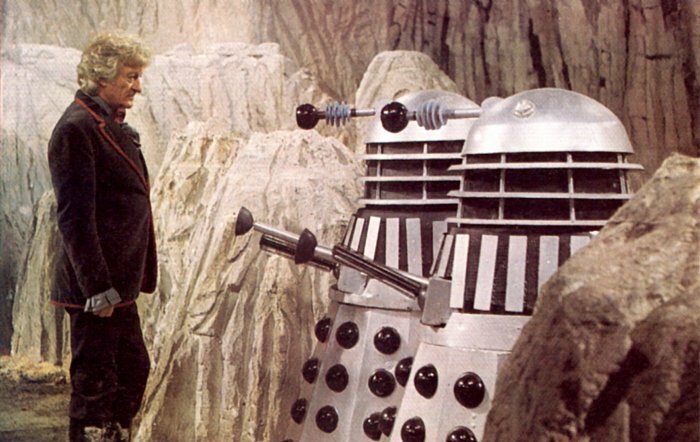 Sunday 24th March sees the broadcast of the four-part 1974 Jon Pertwee story Death to the Daleks in Australia and New Zealand. The story is the 12th instalment in the 50th Anniversary season of Doctor Who stories on the UKTV channel. The story is scheduled in New Zealand at 4:15pm and in Australia at 4:30pm. New Zealand gets an additional screening on Monday 25th March at 4:40am. Death to the Daleks was first broadcast in Australia in 1975. New Zealand got to see it in 1976. A power failure in the TARDIS draws it off course, the Doctor & Sarah Jane Smith end up stranded on the planet of Exxilon. They must find out what is draining their power. UKTV is showing stories throughout the year in the lead-up to the anniversary in November. Death to the Daleks is the last in a set of four stories featuring Jon Pertwee's Doctor broadcast during March. The series will take a break next week for Easter. Next month UKTV will present six Tom Baker stories in four weeks: The Ark in Space (7th April), Genesis of the Daleks (14th April), Pyramids of Mars and The Hand of Fear (21st April), and The Robots of Death and City of Death (28th April).